Exclusively for current or potential members of the club! Free entry. Everybody welcome. Bring your own board. You can also follow us on Facebook. For further information, see the practical info. Congratulations to Zsolt Tasnadi, Leuven Club Champion 2014! Results and ranking. 6th Leuven Open: 31 Participants, Winner Toon Van Herreweghen (November 30, 2014). In addition, Michel Lamote gave an inspiring talk "Luck or Skill?" (pdf). Belgian Backgammon Ratings (2005-2013): From Spreadsheet to Web Application. 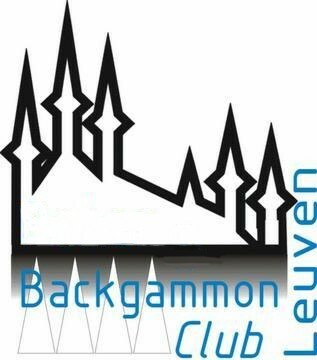 The rating list, which is one of the factors keeping the Belgian backgammon community together, originated in Leuven. Thank you to the "creators", Gerhard Koops and Toon Van Herreweghen. 4 Cubes 2013 Leuven Derby on Saturday, February 23. This year, Leuven fields two teams: Leuven 1, with Toon, Patrick and Johan, and Leuven 2, with Marc, Henri and Akbar. Matches 4th Leuven Open 2012 on YouTube. Thanks to Patrick De Wilde for the realization of the video and thanks to Michel Lamote for the annotations. 4th Leuven Open & 1ste Leuven Junior Cup, Sunday, October 28, 2012. These were winners of the marvellous chocolate trophies of the 4th Leuven Open: 1. Michel Lamote; 2. Johan Segers; 3. Marius Hentea. In the 1st Leuven Junior Cup, the gold, silver and bronze medals were for Jolien, Ward, and Ruben, respectively, but of course, Anaïs, Eli and Sam deserved a medal too. Full results and pictures. Final between M. Lamote and P. van Rooijen. Comments by P. De Wilde Semifinal between M. Lamote and L. Palmans.